Oxford and Cambridge colleges often commission paintings of their heads, fellows, and donors. In 2008, All Souls College decided to honour its non-academic staff with a work of art. The result is to be unveiled at the Ashmolean Museum in Oxford on 13 September 2012. 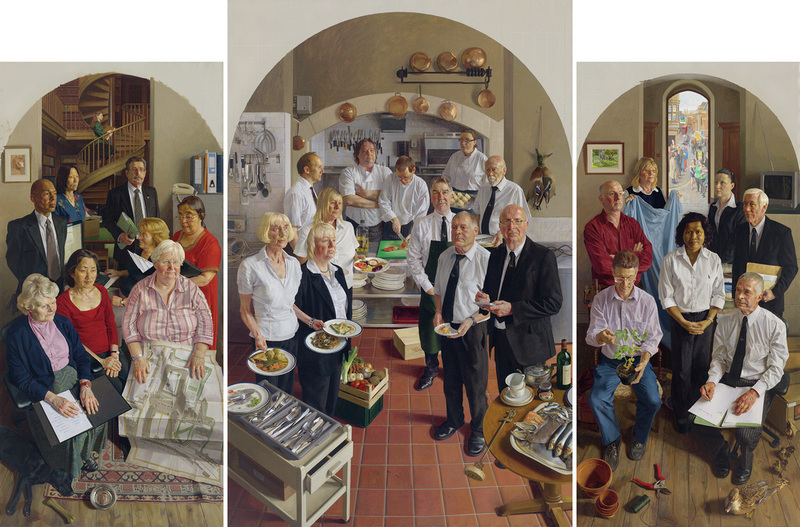 · It is a huge oil painting, on three panels, showing twenty-seven of its non-academic staff in their work settings. · The college was open-minded about the form of the work of art it decided to commission. · The bold scale and design was proposed by the artist, Benjamin Sullivan, in his submission to an informal competition. His proposal is included in the exhibition. · The painting is inspired by mediaeval altarpieces which often take the form of a large three-panel painting (triptych) and which include a multitude of figures. · It is a figurative painting, with echoes of Ford Madox Brown, Stanley Spencer, and David Hockney, although entirely original in conception and execution. It has taken three and a half years to complete. · As a depiction of people in their workplace nothing like it has ever been attempted in Britain. · The artist is young but already well-known for his portraits, which appear regularly at the National Portrait Gallery. He spent eighteen months in the college sketching and painting members of staff. · The three panels focus on secretarial and administrative work (left), on catering (centre), and on housekeeping, porters and maintenance (right). · Members of staff were keen to participate. · The college is more than five centuries old, and the painting is a token of recognition of how much it depends upon and cherishes the people who work in it. · The painting is also a historical document, which is full of visual evidence of current times, which will be used and admired by future generations. An oral history will tell the story of people in the painting. · For the social scientists, it is an investigation by other means of social relations within the college, and in British society more broadly. · For the college as a whole, it expresses confidence in the power of art.